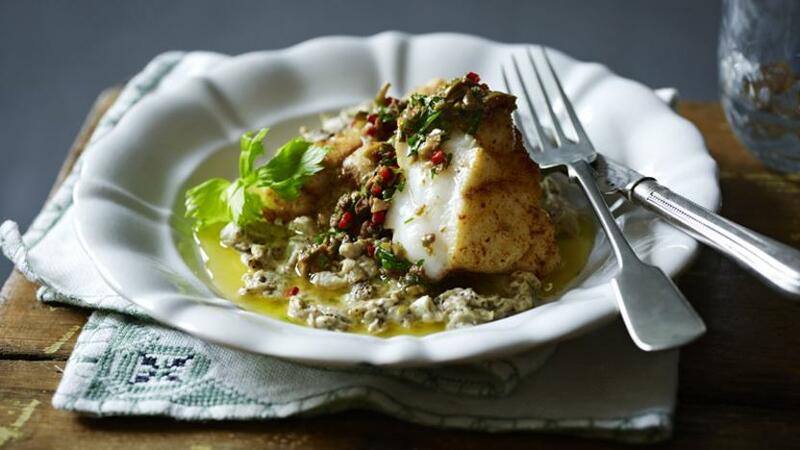 This is a very simple recipe with a piece of lightly spiced monkfish on a bed of aubergine purée served with a sharp, slightly spicy dressing. For the aubergine, preheat the oven to 180C/350F/Gas 4. Put the aubergines over an open flame and burn the skins. When scalded all over, place the aubergines on a baking tray and bake in the oven for 35-40 minutes, or until cooked. Remove the aubergines from the oven and leave to cool. When the aubergines are cool, cut them down the middle and scoop out the creamy flesh – taking care not to pick up any of the toasted black skin. Using a sharp knife, chop the aubergine until it forms a rough purée. Transfer to a sieve set over a large bowl and leave to drain in the fridge overnight. Toast the cumin and coriander seeds, either in a dry frying pan set over a low heat or in an oven preheated to 180C/350F/Gas 4 (this will take 8-10 minutes). When toasted, remove from the heat and leave to cool. Blend the toasted seeds in a spice grinder to form a powder. Pass through a fine sieve to remove any bigger pieces. Heat a little olive oil in a saucepan and stir in one and a half tablespoons of the toasted spice powder. Cook for 2-3 minutes. Stir in the drained aubergine and, when hot, add the double cream, lemon zest and a splash of the lemon juice and season to taste with salt and pepper. Stir through and set aside. Dust the monkfish fillets in the remaining spice mixture. Heat a splash of olive oil in a non-stick frying pan set over a medium heat and cook the fillets for 6-8 minutes, turning all the time so that the spices do not burn. Remove from the pan and baste the fish in melted butter and a squeeze of lemon juice. Set aside to rest. To make a dressing, finely chop the green olives, capers, anchovies and red chillies. Mix together in a large bowl with the olive oil, remaining lemon juice and chopped parsley. Season to taste with salt and pepper. To serve, reheat the aubergine purée, if necessary, and place a spoonful on each plate. Slice the monkfish and place on top with the dressing spooned over. Garnish with the celery leaves. The aubergine may take overnight to drain after it’s cooked, but this is to remove the excess water which aubergines store. You will be left with the juicy flesh. This is similar to Middle Eastern techniques used to make dishes such as baba ganoush.